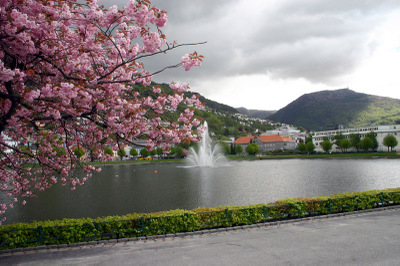 There is a small lake in the center of Bergen very near to the concert hall where I took my audition. On the day of my audition I noticed a large, unattractive metal contraption in the middle of the lake. I couldn't figure out what it could possible be other than some sort of maintenance device. The ugliness of the device seemed very out of place in an otherwise attractive part of town. Cut to Saturday, back in Buffalo. It's the Ugly Thing! In the pretty lake! Apparently, I am not the only person who found the metal thing noteworthy. Visual Norway is the photography blog of a Norwegian man named Rune Eide. 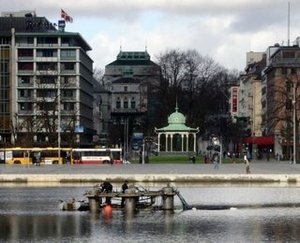 I wrote a brief comment on his blog saying that I had been in Bergen recently, and I had noticed the "thing" and had wondered about it myself. I had a little inward chuckle. I think it is funny that an insignificant mystery from my trip to Norway would reappear after my return home. If you want to see more of Rune Eide's lovely photography (both of these photos are his), please visit Visual Norway. 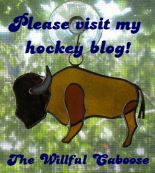 I think it's great that two completely unconnected people, on opposite sides of the world had a little interaction because of our blogs. The Internet has made the world such a small place. A hearty Tusen Takk (thank you) to Rune for clearing up the mystery of the Ugly Thing. Tusen takk (thank you) for those very nice words! Always a pleasure to be of assistance. I'll have you in mind when I walk around Bergen with my cameras and I'll visit your Blog from time to time. Better luck with your next audition! So chiquita, this is it-- the amazing Bergen. It's really hard to believe that it didn't happen... well, it did happen, right? ---Your trip, that is, but the audition was a scam... You know that something other than the base economy was fishy that day, no?. Where are you off to next? It was a pleasure "meeting" you! Yes, please keep us informed about beautiful Bergen. I hear there is a good orchestra on Mars. Travelocity.com is running a sale on all interplanetary travel between now and October. I think I might go for it!